Shockwaves accelerate the healing process by activating the body’s self-healing powers, particularly in cases where the body has been unable to do it on its own. It stimulates metabolism and enhances blood circulation which enables damaged tissue to regenerate and eventually heal. Your therapist will apply shockwaves through a specially designed hand piece that produces strong energy pulses for short periods of time. 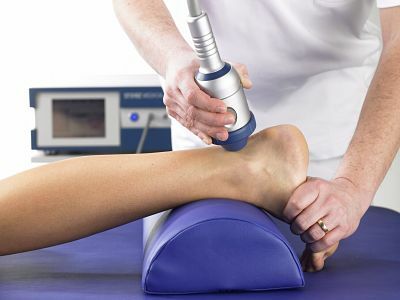 The shockwave energy pulses are applied directly to the affected tissue areas in controlled procedure. Shockwaves have a mechanical effect on the tissue. Pressure in the front of the shockwave is transmitted into the tissue, creating micro-cavitation bubbles that expand and burst into a resultant force. This force penetrates tissue and stimulates cells in the body which are responsible for bone (osteoblast) and connective tissue (fibroblast) healing. Research has also shown that Shockwave also breaks down calcium deposits. After only 2-3 sessions, over 80% of patients report a significant reduction in pain. The therapy session takes about 10-15 minutes depending on the disorder that is treated. In general, 3-5 sessions are necessary at weekly intervals.